In this episode we discuss the potential uses of comic strips and books in B2B marketing. Why and when should you use comics, how can you start producing your own, and how do you get them to audiences? It’s not just Hollywood that’s been finding uses for comic books in recent years. B2B brands have also been using comics, strips and books, to reach new and existing audiences. In the past few years, we’ve seen B2B-focused companies like Google, Moz, MailChimp and others experiment with using comic books and strips as marketing content. On social platforms such as LinkedIn, business focused comic strips and single comic panels have been finding a new home. We’ve also seen an increase in visual note taking at conferences, where entire seminars are broken down into cartooned bits of information, as was seen at the recent Content Marketing World. In this episode, Fiona and I examine the potential uses of comics in B2B marketing and give some tips on how you can go about creating your own comics. Download the episode here (right-click and “save as” to download). Or listen in the player at the top of the page. 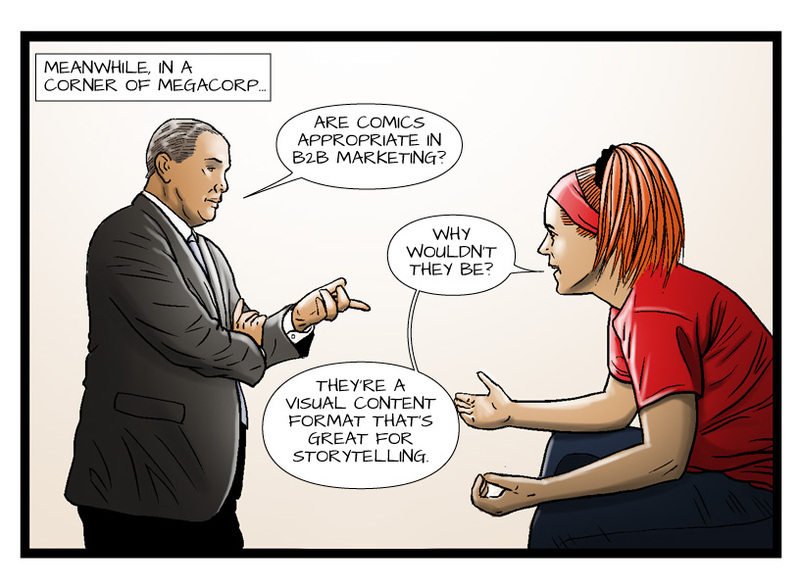 Our eBook on how to use comics in B2B marketing can be found here. And if you’d like more advice on how to format dialogue and captions in comics: head here. Unsure how long a B2B comic should be? Then read this comic length guide. Music by Industrial and Marine.